Heavy spring rains across the American mid-west have mitigated the region’s extensive drought. However, they are expected to cause a record large dead zone in the Gulf of Mexico this summer. According to a recently released forecast from NOAA and its research partners, the University of Michigan and Louisiana State University, the Gulf dead zone this year could grow as large as 8,561 square miles. If it reaches this size, which is roughly equal to the state of New Jersey, it will be the largest dead zone ever recorded in the Gulf. Dead zones are areas in large bodies of water that do not have enough oxygen to sustain aquatic life. They are usually caused by nutrient pollution from agricultural run-off. Specifically, excessive amounts of fertilizers – nitrogen and phosphorus – create massive algae blooms. When the algae die, they sink to the bottom where they are decomposed by bacteria. This process uses up most, if not all, of the available oxygen in the water. As a result, fish flee the area and immobile bottom dwelling organisms, like clams, die. The Midwest is this nation’s agricultural breadbasket and its farmers use fertilizers to help grow an enormous amount of crops. It is also the watershed of the Mississippi River. As such, the flooding rains that swept through the area this spring have significantly increased the nutrient load of the water that is flowing into the Gulf of Mexico. A large dead zone will likely have serious economic ramifications for the Gulf region’s multi-million dollar fishing industry. 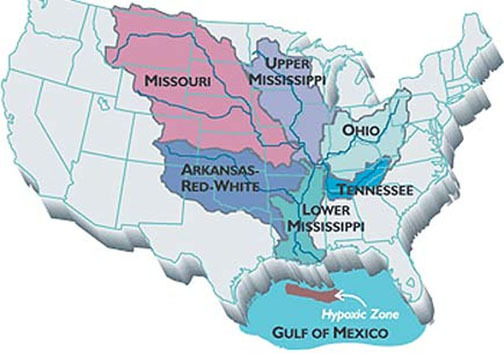 Watershed of the Mississippi River runs through America’s agricultural heartland and ultimately drains into the Gulf of Mexico. This entry was posted in weather and tagged economics, national, ocean, rain, wildlife by Melissa Fleming. Bookmark the permalink.